The flavors sound alarming, but have some faith and take a taste -- they do seem to work well in this medium. The flavors in question are li hing mui, kim chee and Korean barbecue, and the medium in question is popcorn. Hawaii Popcorn Co., maker of Hawaiian Hurricane Popcorn for more than 10 years, has new flavors in Wal-Mart and select Longs Drugs stores. The varieties were introduced at Christmastime, in a four-pack sold at Costco. The fourth flavor was Thai curry, but company president Mark Doo said that one didn't go over as well (although it was his personal favorite). 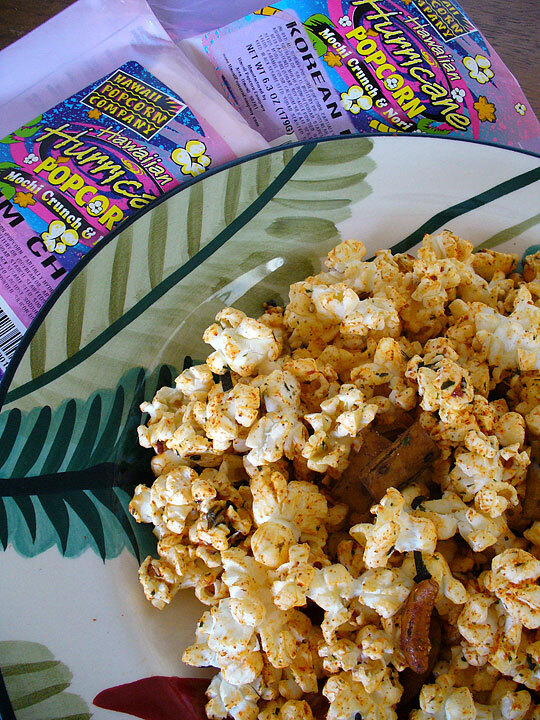 The do-it-yourself microwave popcorn comes with packets of arare and nori, plus seasonings, a butter mix and a big bag to shake it up in. The li hing and kim chee flavors pack some punch, but the barbecue is on the mild side. The packages sell for about $4.